Charlie Roumeliotis: Scouts listed to attend last night’s Blackhawks-Canucks game: Pittsburgh Penguins (2), Boston Bruins, Carolina Hurricanes, Colorado Avalanche, New Jersey Devils, Nashville Predators, San Jose Sharks and the Toronto Maple Leafs. Ryan Pike: Scouts listed to attend last night’s Flames-Sharks game: Montreal Canadiens, Edmonton Oilers, Buffalo Sabres, Minnesota Wild, Toronto Maple Leafs, New York Rangers, and the Philadelphia Flyers. Adam Kimelman: Scouts listed to attend last nights Kings-Flyers game: San Jose Sharks, Toronto Maple Leafs, Chicago Blackhawks, Boston Bruins, St. Louis Blues, Columbus Blue Jackets, Washington Capitals and the Vegas Golden Knights. Mike Harrington: Toronto Maple Leafs assistant GM Laurence Gilman was listed to attend last night’s Sabres-Hurricanes. Still looking at Hurricanes defensemen? TSN: Pierre LeBrun on the Maple Leafs and Hurricanes who apparently are still talking. “One of my sources in Buffalo saw Maple Leafs assistant general manager Laurence Gilman in the press box in Buffalo for Thursday’s game against the Carolina Hurricanes. I don’t think he’s there to scout the Sabres, as far as I can tell. 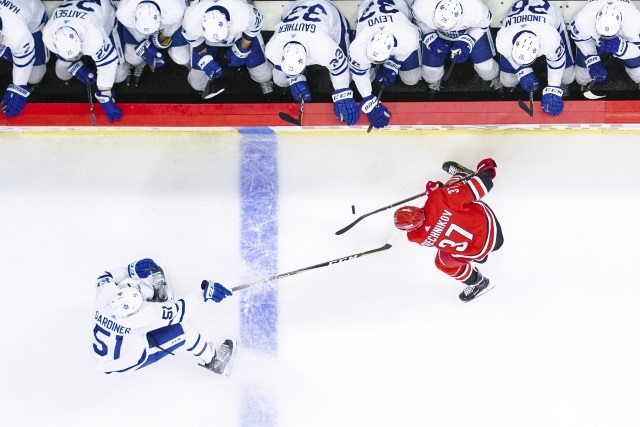 Is Gilman there because the Leafs still covet a right-handed shot defenceman, or is it because Micheal Ferland, who has been on the market, is a power forward and that’s a scenario where the Leafs could use an upgrade. Pierre LeBrun: Agent Pat Brisson was that the Maple Leafs-Senators game on Wednesday. He met with Leafs GM Kyle Dubas after the game to catch up a bit. Brisson represents defenseman Jake Gardiner and you have to assume that he was looking for some clarity on his client. It would be hard for the Maple Leafs to do but he’s still an option for them.